After I replaced the balun and coax tails on my MA-5B, I posted recently to say I wasn’t quite as happy with the results as I could have been. I contacted Bob at Balun Designs who suggested that if I’d made the coax tails a different length to the originals that I may need to retune the aerial. He also said that if the SWR was higher with the replacement balun then it was likely that the original didn’t have as much isolation as the replacement and so the feeder could have been loading the aerial. This all makes sense. I decided to replace the coax tails with two the same length as the original and so they were constructed. I fitted them today and retuned the aerial as suggested. I checked all the element lengths to ensure they were correct as per the installation instructions and set the length of the front and back elements so that in theory the aerial should tune best at around 14,125kHz. That’s the only specific tuning that can be done. Once it was done and returned to the vertical position, I had a quick look using an MFJ-269 that I’ve borrowed from Tony, G0MBA. That produced adequate results and so I tied everything off and went out to the local radio shop to pick up my replacement SGC-237 Smartuner. More of that in a later post. 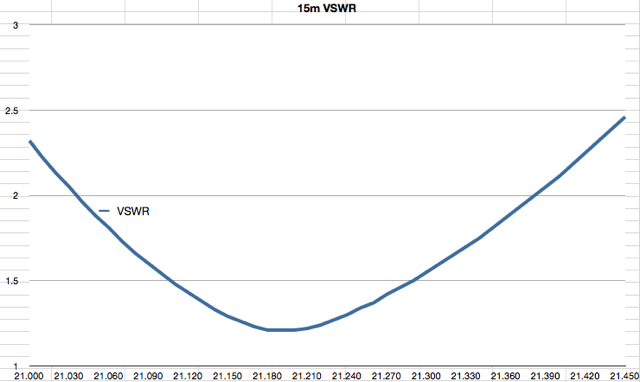 On my return I decided to produce proper VSWR plots of my Cushcraft MA-5B. I’ve recently bought a new meter, an Array Systems Power Master II and was keen to see the plots. I’ve been looking for a good meter for quite some time and although the Power Master II is expensive, the price is comparable with buying a Bird model 43 along with all the slugs to cover from 1.8MHz to 50MHz, from 0.5W to 3kW and the Bird doesn’t offer +/- 3% accuracy either. So onto the plots. The first one is 20m. This is a little narrower than I hoped and so I may need to lower the mast and adjust this again. I accept that it’s not going to cover the entire band and so I must decide what I’m going to operate, whether it’ll be data or SSB. I suspect the answer is mainly data so I’ll need to just lengthen the elements by half an inch or so (to start with) to bring that dip right into the data segment of the band. When there’s a contest where I know I’ll be operating on 20m I can simply lower the mast and shorten the elements again to move the dip back into the centre of the SSB section. I’m happy with this on 15m, as expected, the bandwidth is a bit wider than on 20m and so therefore it’s nicely usable on the data section of the band and perfectly usable right up to the top of the SSB section. My Acom 1000 amplifier will be happy operating into this over the whole band. This one took some time to plot with 170 different readings as the band is so large. Once again, it’s usable over the entire band although if I’m operating the TS-590 barefoot then I’ll use the internal ATU if I’m working FM in the top section. However, I don’t do that very often so it’s not something I’ll need to do much. As with 15m, my amplifier will happily run over the entire band with no complaints. There’s not much to say about 17m and 12m really – The Cushcraft MA-5B is a single rotary dipole on those two bands and they’re narrow enough to easily be covered. I have nothing to worry about there. 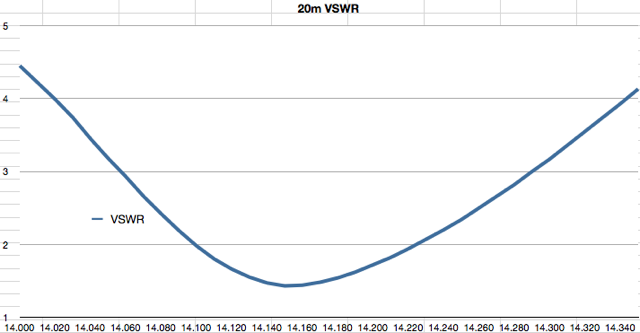 This entry was posted in Amateur radio and tagged cushcraft ma-5b, cushcraft ma5b, ma-5b, ma5b, swr, vswr. Bookmark the permalink. Hi Keith, thanks for your reply. 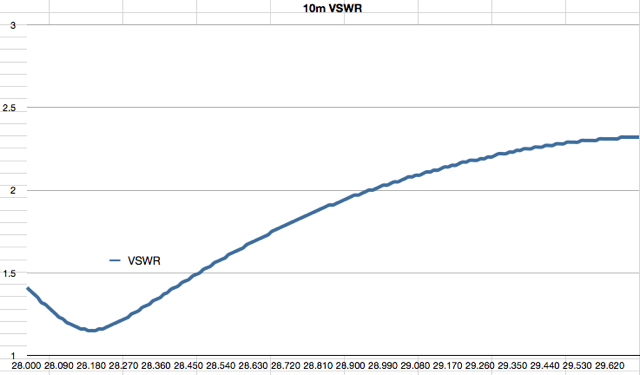 I fixed it: I changed the phase/polarity of the feedline to the elements and the SWR was more or less o.k. Changed the aerial measurements to 22.5 cm. on each side (for element 1 and reflector) and it worked! 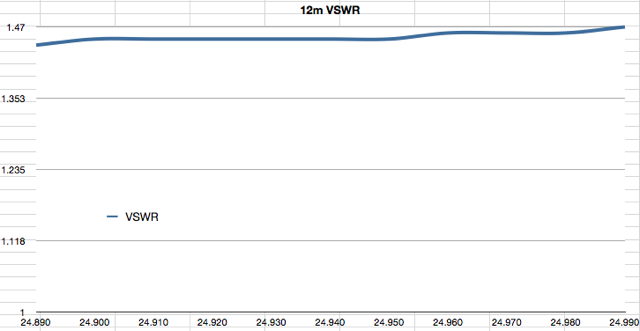 Maybe some fine tuning this week to get a better SWR on e.g. 14.070 mHz.